This screen allows you to link your diary with modern activity trackers, weight scales, blood pressure meters and other apps and devices. After linking you will see the data from your device in your diary. For some vendors like Fitbit, linking results in uploading your food data to your account with the vendor. After purchasing a device like Fitbit activity tracker, you can register the device and create an account at vendor's website or in vendor's mobile app. 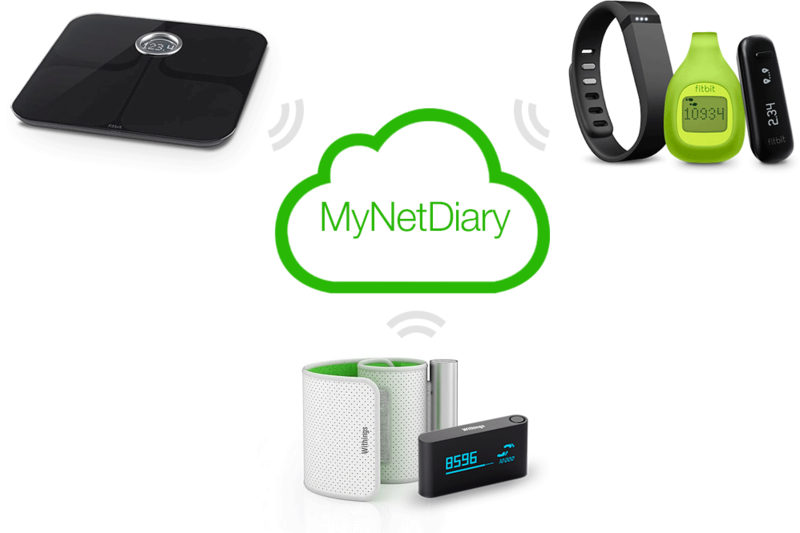 In order to link your diary with the device, select one of vendor devices on "Apps & Devices" MyNetDiary screen. You will see a vendor-specific linking instructions. Tap "Link to" button. You will be redirected to vendor's website in order to authorize linking MyNetDiary with this vendor. After you log into the vendor's website and complete linking, MyNetDiary will show "linked" status for the device. Once linked, MyNetDiary starts retrieving your device data into your diary. For example, you will see "Fitbit exercise" calories logged along with your manually entered exercises. All screens, charts and reports of MyNetDiary will use the data obtained from the vendor. If you have multiple devices from the same vendor, e.g. Fitbit activity tracker and weight scale, linking results in retrieving the data from all active vendor's devices. Please notice that MyNetDiary does not know your vendor's password, it uses authorization obtained at vendor's website. Only Twitter linking is available in the free app. Linking to Fitbit, Withings, Garmin and other vendors requires Maximum membership. Select vendor device on this screen and tap "Verify" button, your data will be synchronized immediately. MyNetDiary shows the last and the next synchronization time for the vendor. In order to remove an existing link, select a linked device on "Apps & Devices" MyNetDiary screen, then tap "Unlink" button. You can also break the link by logging to vendor's website and terminating the link at vendor-specific account management page.